I've always known that we had something unique going on. I mean, how many 30-something non-Amish full-time farmers are there anymore? But recently we've learned that not only is our life on the farm rare, but we are raising endangered species! According to the American Livestock Breeds Conservancy (ALBC), we are raising two breeds on their conservation priority list. Decades ago Husband's grandfather decided to raise Ayrshire dairy cattle, probably for their hardiness, their rich milk, and their overall appealing look. Over the years while other farmers either left dairying altogether or switched to higher-producing Holsteins, our farm stayed with Ayrshires. According to the ALBC, there are fewer than 2,500 Ayrshires registered annually in the United States and the estimated global population is less than 10,000, putting the breed on their Watch list. While the decline of the Ayrshire breed happened slowly around us, the rarity (or plain old unpopularity) of Herefords was well known to us when we started raising them. When Husband and I were engaged, we saw a special exhibit at the Ohio State Fair of this old-time breed that was making a comeback, Herefords. A year or so later Husband returned from a pig show and told me to come outside and see the pig he bought me. Our first Hereford gilt raised State Fair champions the very next summer and soon, as State Fairs started offering Hereford shows, our pigs were in demand. 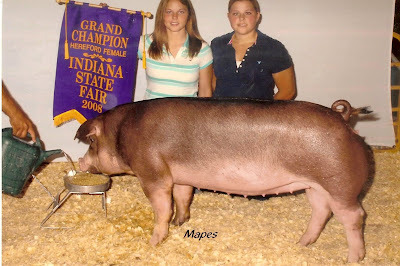 We have been producing State Fair champions ever since (see champ from the 2008 Indiana State Fair pictured above) and doing a steady business in s&men sales too. Even for all our efforts to grow and improve the Hereford breed, they are, according to ALBC, on the Threatened list, with fewer than 1,000 annual registrations in the United States and estimated global population less than 5,000. So here we are: living a rare life on a family farm with a rare full-time farmer under 40, who raises rare species. For some reason, things are rarely normal around here. I'm the Marketing and Communications Manager at the American Livestock Breeds Conservancy and I just wanted to thank you for mentioning us in your blog. It's the efforts of people like you that really help preserve and protect rare breeds. That's very interesting. I didn't know they were endangered breeds. Someone must be doing good in this bad economy. Way to go!